Glenn Eames carries a cardboard coffin to City Hall in protest of the Burlington College development agreement. 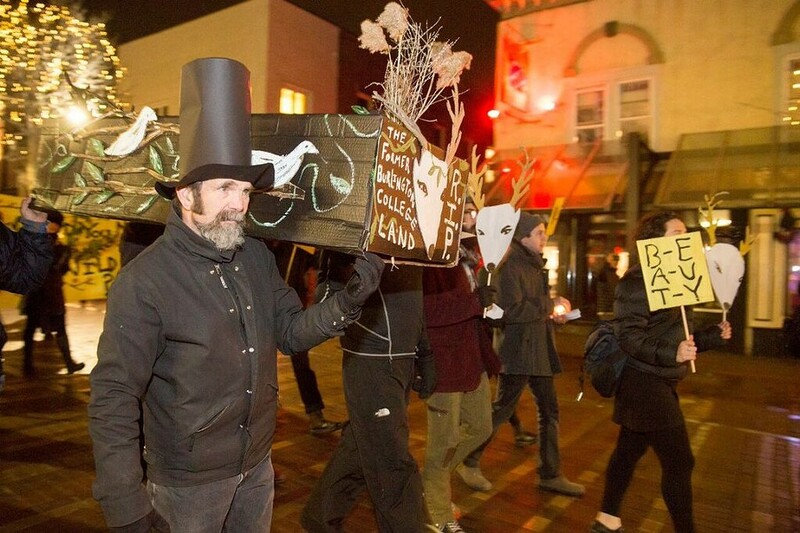 Monday night may have been the first time in Burlington's history that the city council convened around a coffin. 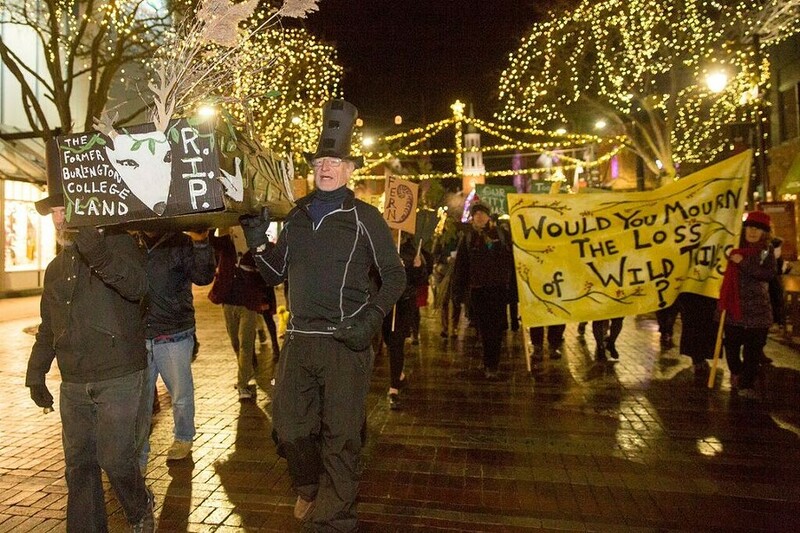 Residents who oppose a development agreement for the land behind Burlington College placed the cardboard replica, adorned with woodland creatures and a bouquet of reeds, in front of councilors. Despite the objections, the city council voted unanimously to approve the agreement. 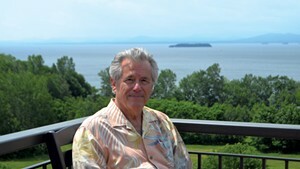 Eric Farrell, the developer who purchased the land from Burlington College, plans to build as many as 770 units of housing on the lakefront site. After an outcry from residents, he agreed to negotiate with the city to preserve some of the open space. In early December, Mayor Miro Weinberger announced that his administration — along with the Vermont Land Trust and the affordable housing developer Champlain Housing Trust — had reached a deal with Farrell. Under the plan the city council approved Monday, Burlington and the land trust will purchase and preserve 12 acres from Farrell for $2 million. Housing, including 160 affordable units, will occupy the remaining 15 acres. That development is still contingent on passing the city's normal zoning review and the state environmental review. Open-space advocates congregate outside City Hall ahead of the city council vote. 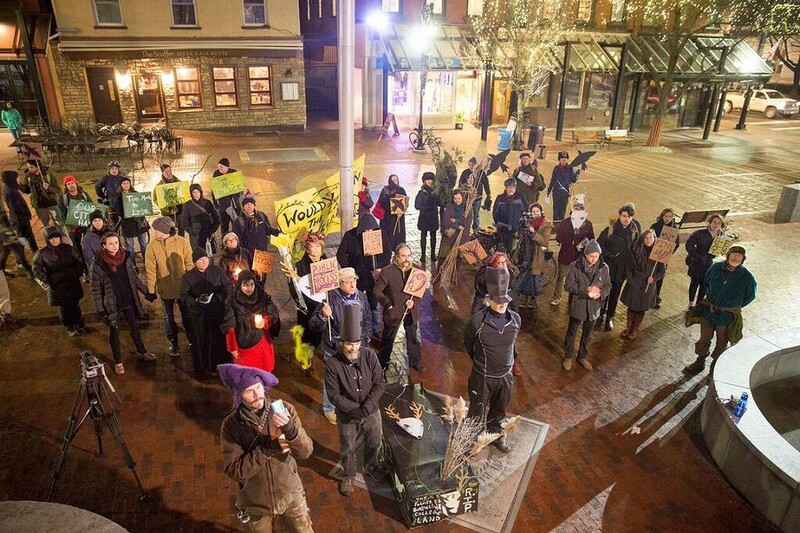 The pallbearer-protesters — who led a mock funeral processional down Church Street that ended at Burlington City Hall — told the council that the deal wasn't good enough. Jen Berger, shrouded in a black hood, predicted that replacing open space with a large neighborhood would contribute to climate change. Others cited more concrete problems, making the case that the plan would worsen Lake Champlain's water quality and that animals would lose their habitat. "It’s a bad deal for the environment," concluded Charles Simpson. Andy Simon argued that it was a raw deal for the city, too, in part because some of the land it's purchasing is not suitable for development. Proponents of the plan articulated an opposing environmental perspective. "Density is green," said Housing Vermont President Nancy Owens, making the case that urban development offers a preferable alternative to suburban sprawl. The mock funeral procession makes its way down Church Street. While preservationists came bearing their coffin and cutouts of birds, a who's who of affordable housing advocates showed up armed with statistics in support of the development. Kim Fitzgerald, CEO of the senior housing developer Cathedral Square, told councilors that her organization has 1,000 applicants on a waiting list. Under the agreement, Cathedral Square would build senior housing on the site. Others described the deal as a huge opportunity to address the "desperate" need for affordable housing. "This project is really cause for celebration and not mourning," said Brenda Torpy, CEO of Champlain Housing Trust, which receives an average of 140 applications a month for roughly a dozen available apartments. Before the council voted, Tom Ayres, a Democratic councilor representing Ward 7, thanked residents for an "extraordinary display of the democratic process."